The Winnipeg Jets were a smashing success in their first season in Canada -- everywhere but in the Eastern Conference playoff race, a situation they're hoping to remedy in year two. The transplanted Atlanta Thrashers were beloved in their new home, which pined for NHL hockey since the original Jets left for Phoenix 15 years earlier. A crowd of 15,004 fans packed MTS Centre for each of the Jets' 41 home games, giving the franchise the kind of love and support it rarely enjoyed down South. The Jets responded by going 23-13-5 in front of the home folks, up from 17-17-7 in the Thrashers' last season. MTS Centre quickly developed a reputation as one of the toughest places in the League for road teams -- and with another season of packed houses all but assured, visitors figure to have an even tougher time winning in Winnipeg. The Winnipeg Jets filled their biggest need by signing arguably the best center on the free-agent market this summer in Olli Jokinen. The Jets improved by only four points (80 to 84) from the previous season and missed the playoffs for the fifth straight time, so general manager Kevin Cheveldayoff knew he had to make some moves -- especially in the middle, where the club needed the most help. Cheveldayoff hopes he's filled that void by signing Olli Jokinen, who had 23 goals and 61 points for the Calgary Flames last season. Jokinen isn't the 30-goal scorer he was for the Florida Panthers a few years ago, but he's better than anyone the Jets have and gives them a legit first-line man in the middle. "We're very, very excited to get him," Cheveldayoff said. "He's got size and a tremendous amount of experience. We believe that with adding the size of [Alexei] Ponikarovsky and now Jokinen that we're a much bigger and harder team to play against. "We worked extremely hard at this deal as we did on other deals that didn't come in our direction. 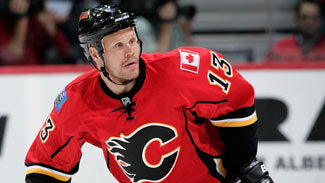 All you can do is put your best offers forward and we're very happy to have Olli as part of the Winnipeg Jets family." An added bonus for one of the NHL's smaller groups of centers is that Jokinen is 6-foot-3 and 210 pounds, meaning he adds size as well as skill. "His size comes to the forefront," Cheveldayoff said. "He's difficult to handle when he gets moving and he does move very well. He likes to shoot the puck and he's not afraid to do that, and there are lots of opportunities for him to score and opportunities for other players to score off of rebounds and create plays." The Jets also added Ponikarovsky, a valuable forward in the New Jersey Devils' run to the Stanley Cup Final. He should be a solid third-liner -- he's scored 20 or more goals four times in his career and had 14 goals and 33 points with the Carolina Hurricanes and New Jersey last season despite minimal power-play time. The Jets are hopeful Ponikarovsky will provide a spark to former Toronto Maple Leafs teammate Nik Antropov, whose production has dropped from 24 goals and 67 points in 2009-10 to 15 and 35 last season. Jokinen's arrival should take some of the pressure off Antropov, who found himself on the fourth line at times. While the middle has been a muddle, the Jets do have some talent on the wings. Evander Kane had 30 goals in his third NHL season, up from 14 and 19 in his first two, and all indications are he'll be a star. Blake Wheeler led the Jets with 47 assists and 61 points, and captain Andrew Ladd scored 28 times while providing leadership for a group of players that had to relocate from Atlanta to Winnipeg in a short amount of time. There's also plenty of offense from the blue line. Dustin Byfuglien's 53 points tied him for second among NHL defensemen, and Tobias Enstrom and Zach Bogosian each finished with at least 30 points. They were part of the reason the Jets were second in the NHL in power-play success at home (22.0 percent) and 12th overall (17.9 percent). The Jets used their first-round pick on USNTDP defenseman Jacob Trouba, who for now is headed to the University of Michigan. The Jets took Trouba because most of their problems are in their own zone -- their 242 non-shootout goals allowed were 26th in the 30-team NHL. Most of those came on the road, where the Jets were 14-22-5. The defense has to give more help to goaltender Ondrej Pavelec, whose 2.91 goals-against average and .906 save percentage in 68 appearances weren't helped by seeing more than 34 shots per 60 minutes of playing time. Al Montoya, who played with the New York Islanders last season, was signed to back up Pavelec, who received a new five-year deal this offseason. Aside from the addition of Jokinen, the Jets seem determined to improve mostly from within -- by letting young players Kane, Bogosian and Mark Scheifele grow into their roles. Cheveldayoff is hopeful the addition of Jokinen will speed up the maturation process, but the GM seems determined to go for steady progress rather than splashy signings.